Even in end stage of life, repositioning is especially important if they have pressure sores. This prevents wounds from worsening, possibly even allowing them to heal, which is in favor of the patient's comfort. Can RN works as a floor nurse in Nursing home/LTC? Hello CapeCod, That's correct, I had forgotten. Thank you! By the way, I have really enjoyed your posts over the years regarding SNF. Very inspiring and educational for me, since I'm in that field as a new nurse. Keep up the great work at your facility and on this forum. Yup, it is currently done everyday, all over! I am an RN at a Skilled Nursing Facility that has plenty of LVNs, and even I work the floor on a daily basis. I do all the things that the LVNs do (med pass, treatments), and in addition, I hang IV medications. LVN's cannot hang IV medications. Even if they are IV certified, the most they can do is IV starts. For this reason especially, Skilled Nursing Facilities will always need RNs! Further, there is such a great market for RN jobs in SNF because most RNs are flocking elsewhere (e.g. to higher paying jobs and/or jobs with smaller patient ratio). It can be very challenging for SNFs to snag enough RNs. However, I have found that in some cases, you can make a salary that would be comparable to hospital. This is because in SNF there are always opportunities for extra shifts. In fact, I'm in the middle of working 8 days in a row as we speak! My earnings are through the roof right now, and working this much is not even all that hard on me because I enjoy it. It's a job I like. I feel very challenged. The shifts go by incredibly fast. I get great exercise while I'm there. I love taking care of my patients, who are like my family. I have fun with my coworkers, and feel comfortable with them. This kind of work gives my life meaning and purpose. I count it a blessing that I get to wake up and do this everyday, and get paid for it! I couldn't ask for a better life. I'm grateful for the opportunities that SNF provides for RNs. There really are some fantastic facilities out there, you just have to find them. 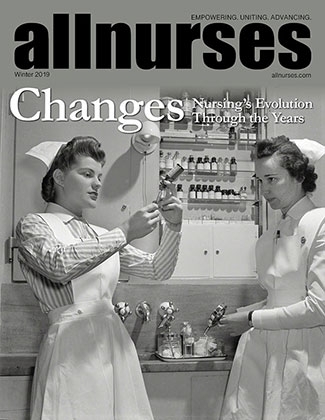 I am still a fairly new nurse, including one year of experience in Skilled Nursing, which is my current field. One of my weaknesses is in figuring out the best way to transfer patients in difficult situations, such as after a fall. Often my CNA's have better ideas, and make better decisions, than I do about how to move the patient. It is humbling, since after all, I am in charge and the leader. (I don't mean that my CNA's don't listen to me, but rather, they figure it out before I do, and come up with a plan better than I could have.) There have been some falls where I felt absolutely clueless about how to get a patient off the floor, and I had to rely on my CNA's to take the lead in creating a plan. But this isn't rocket science! Why am I struggling with this? I feel dumb. Maybe it's the stress and spontaneity of the whole situation that is blocking me? Currently, I just do the best I can as a leader after a resident fall, and even when I don't feel sure what to do, I remain calm, helpful, present, communicative, and supportive to my CNA's. How can I get better at my competency and critical thinking skills in this area? What makes one a "great nurse"? Fantastic answer, PsychNP! I definitely learned some new things from it. Thanks! Why can't the basic OTC multivitamin tablets be crushed? Does it have to do with release timing? There is nothing on the bottle that says it cannot be crushed, however I was informed by other staff recently that it cannot be crushed. But my co-worker called the 1-800 number on the bottle and the representatives said that it could be crushed. What is the verdict on this, especially in regard to state surveyors? There are many different opinions! Can a shy person be a good CNA? How do you console or give encouragement to someone that is very sick? When a patient is dying and expressing their feelings, sometimes they just want to be heard. Providing false reassurance can only increase their frustrations. The key is to simply give your listening ear, and one option for an appropriate and therapuetic response is a genuine "I'm sorry." It validates their feelings and struggles, and offers compassion and support, without compromising honesty.